Retirement Income Specialist. Your source for Financial Services, Estate and Elder Planning and Tax Planning. WATCH THIS VIDEO! MAKE YOUR MONEY WORK HARD for YOU! Today’s baby boomers and seniors face many challenges including cash-flow, health, longevity, family needs and changing lifestyles. FREE Booklet! Five Key Steps To Improve Your Bottom Line! Confused as to How to Start Planning? Do you have a plan and if not, why not? We can help you set one up. Plans should be reviewed annually and whenever you have life changing events. Thinking it is Too Late to Create a Plan? 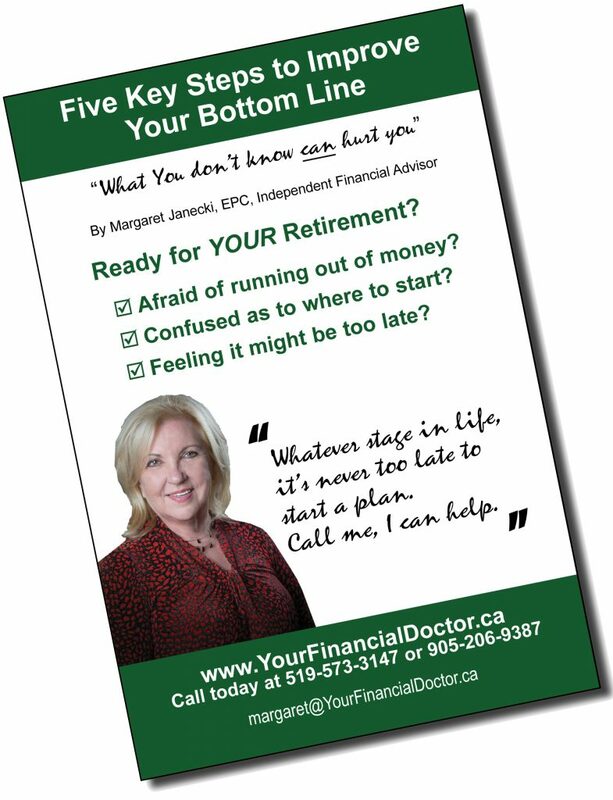 It is never too late, but IT IS CRITICAL to have a retirement plan, review it and tweak it regularly. Call me today, I can help. Get Your COMPLIMENTARY Booklet! Five Key Steps To Improve Your Bottom Line! Concerned About End of Life Care? As Canadians live longer, retirement gets longer and more expensive, meaning that a significant percentage of Canadians are in danger of outliving their next egg. Contact Me. I Can Help. Are you a grandparent? Do you want to contribute to an RESP for your grandchildren? The family dynamics for retirees has changed. Once we cared for our kids, now the “sandwich generation” is looking after adult children, grandchildren as well as their own parents. Supporting children and parents can alter retirement plans. Today’s baby boomers and seniors face many challenges including cash-flow, health, longevity, family needs and changing lifestyles. Therefore it is critical to have a retirement plan, review it and tweak it regularly. One of the biggest considerations for those 40 years and up, is start working on a plan. Many of the “X” generation are already working hard to grow their portfolios, looking after their children, potentially their parents and an ill partner, sibling or child. 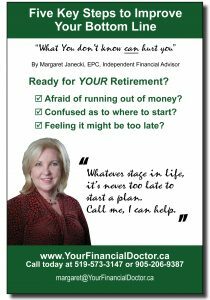 They are painfully aware that retirement is somewhere in the not too distant future and they need to take some time to develop a plan. It is wise to review your plan any time, you are faced with life changing events, such as changes in employment or becoming self-employed, purchasing a home, marriage/divorce, having a baby or raising grandchildren, and death of a family member. There are 5 steps of which to be aware when forming financial plans; Financial Plan, Manage Debt, Family Discussion, Health and Insurance. Register to Receive Your Complimentary Copy of the Five Key Steps to Improve Your Bottom Line.